With the cost of rim and tires these days, you do not want to have to pay a hundreds of dollars for a new rim or tire. Below is the proper way to adjust and position the mount head. 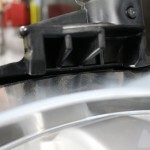 This is a small part of maintaining your tire changer, but something that can prevent a major issue down the road. 1. After the wheel is secured to the turntable, pull the overhead swing arm into position so that the mount/demount head is directly over the edge of the rim. Pull the vertically sliding hex shaft down until the mount/demount head comes into contact with the rim. Turn the Locking Lever to lock the hex shaft into place. 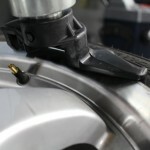 As the locking lever is engaged, the mount/demount head will move approximately 1/8″ away from the rim’s edge. 2. The mount/demount head roller that is now making contact with the wheel should be properly positioned 1/8″ from the rim edge by turning the swing arm-adjusting knob. This setting will be maintained, as long as the locking lever and adjustment knob are not changed. NOTE: With the mount/demount head set in the proper position, the operator may move the swing arm in and out of the way without having to reposition the head; so long as the same tires and wheels are being serviced. However, the head should be regularly checked for proper clearance, even when servicing the same tire and wheel combination. 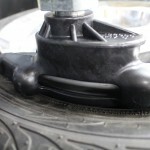 Improper clearance can result in damage to wheel and/or tire. 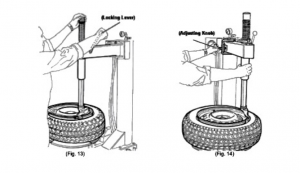 This is a very helpful and simple procedure that will protect not only your customers rim and tire but could ensure that you are protected from possible expensive results of misuse. All of these items can be purchased directly from Eagle Equipment by giving us a call at 800-336-2776. I have a question regarding the duck head on a tire machine. Is there different size duck heads ,or are they all the same size?? Thank you and have a great day!! All of our car tire changers have the same duct head size, specifically for Eagle machines. They are not interchangeable with other brands. The motorcycle tire changer duct head is smaller than the car tire changers. Let us know if we can help you. I need a plastic insert for the duck head on an ETC-550. The larger of the 2 inserts. My duck head is extremely slack. Hoe do you recommend that I tighten it. The allenkey screws doesn’t help. 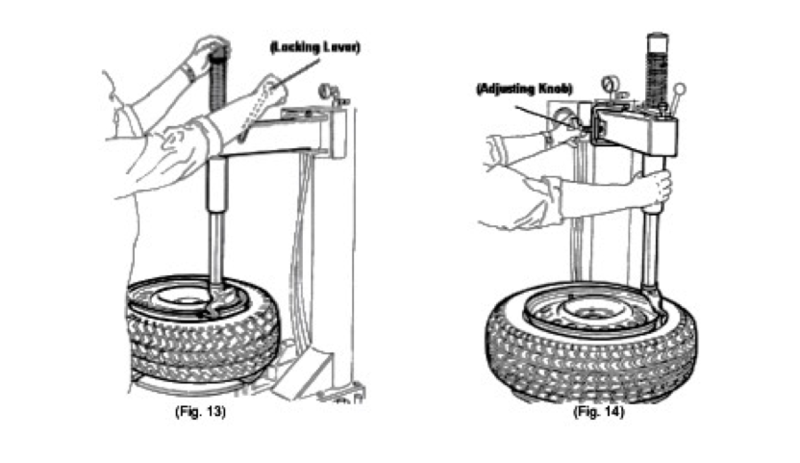 I am looking for a duck head(plastic) For my Eagle tire machine. I also need the yellow plastic inserts for the metal one that came with my machine. I just installed this today, along with a balancer. I was able to download the user manual for the balancer, but can’t find one for this unit. I want to have them printed by the machines. Can I get a user manual for this unit? We would be happy to send you the manuals you’re looking for. Can you send the model numbers you need with a request for the manuals to webmaster@standardtool.com and we’ll get them to you. Thank you. Next Next post: Chris Wilson joins our maintenance department!